Plenty of jackfruit is available in Mumbai. In my everyone Like jackfruit very much. From jack fruit i made chakka varatti. chakka payasam, chakka curry. For evening snack I wish to prepare chakka dosa.It is similar like vella dosa. in that we adding jackfruit pulp. This dosa is different than the regular ones in that its thick and sweet and does not really need a side dish./chutney. 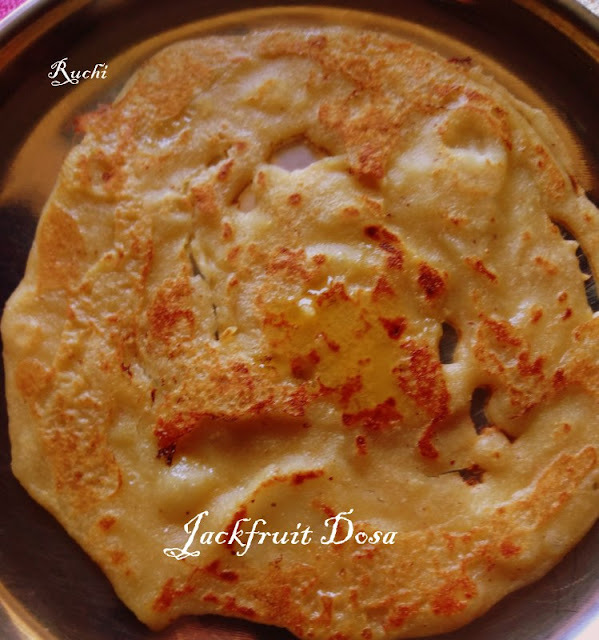 Jackfruit flavour ,cardomon and dallop of ghee makes this dosa heavenly delicious. 1.Wash and soak the rice for 1-2 hours. 2.Chop jackfruit into small pieces. Also chop jaggery in to small pieces. 3.Mix all the ingredients well (rice, jack fruit pieces, jaggery, salt, grated coconut). 4.Add some water and blend well in the mixer until it forms a fine paste At this point taste the batter to check for its sweetness. If desired add jaggery more and grind it further. 5.he batter can be used immediately for preparing dosa. 7.Once the lower part of the dosa turns golden- brown, flip it. 8.Wait till it gets golden- brown spots on the second side. Once done transfer it to a plate. 9.Serve it immediately with generous drizzle of ghee. *these dosas are generally thick and soft and they need to be cooked on a gentle heat. The dosa will burn on a high heat as it has jaggery in it.